"He understands that staying to the big part of the field and really taking what the pitcher gives him is something that's going to beneficial for him," said Jay Bruce. "It's not so much a feast-or-famine thing when you're cutting down the area of the field you use." 2014's sample size is insanely low. I almost didn't include it, but it does provide some insight into why Bruce has struggled so far this year. In terms of any future prediction, however, I'm ignoring it. 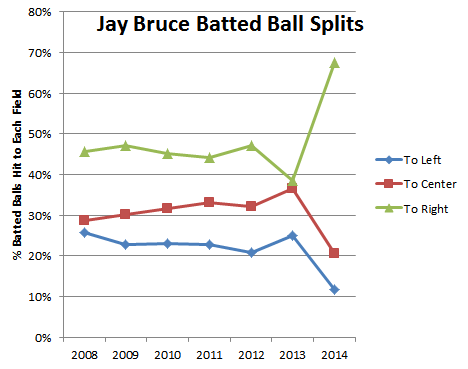 For most of Bruce's career, he's been pretty constant, with a slight trend toward more balls hit to center field and fewer hit to left (his opposite field). Last year, however, he made a pretty dramatic change. He hit far fewer balls to his pull side, and far more to left and center field. In other words, as he referenced, he was using the entire field, not just right field. It may be a coincidence, but last year he posted the second-highest BABIP of his career (0.322; career 0.294). 2) Pull hitters often hit balls in the air to the opposite field, not on the ground, negating the concern with pitching lefties outside when deploying the infield shift. The increase in balls hit to left field last season is pretty dramatic--even after we eliminate all of his fly balls. Bruce was definitely hitting more balls to his opposite field last year. Now, let's look at what he did on pitches inside and outside. Here is Bruce on balls thrown to him on the inside half of the plate (zones 3, 6, 9, 12, & 14 at Baseball Savant). Not a big difference. Pitch Bruce inside and he'll try to pull the ball. That's more or less what would be expected, because he's a power hitter. Ok, now, what if you pitch him outside? Wow. In 2012, if you pitched Bruce outside, he often (usually?) would still hit it to his pull side. In 2013, however, he started going the other way with the pitch far more often. And look at the results: he got 75 hits on balls on the outside half of the plate last season, including six home runs (3 were opposite-field). If you're spraying the ball all over the field, you become far tougher to defend, and you're likely to pick up more hits. Despite his success, it is worth noting that of his hits to left field in 2013, only eight were on ground balls (and one of those was an infield hit). All the rest were on line drives, which may or may not be defendable by infielders. And, as you can see, he's just not making outs on ground balls to third, either (probably because teams are usually shifting on him). Therefore, if I'm defending Jay Bruce, it makes sense to play your outfield "honest," but you can probably still deploy the shift against him and succeed most of the time. Now, so far this year, Bruce is struggling. When he's making contact, he's hitting almost everything to right field. If he can get back to what he did in 2013 and use the entire field, especially on outside pitches, he stands to see him performance increase. That's something I'll be watching to see him do in the coming month.